Start selling in January 2001.It is Japan's firstterminal compatible with"i-appli"mobile application.Liquid crystals of all terminals were colorized.Because the 2xx series became i-mode, the 50x series became the meaning of the application compatible machine. We arepleased to announce the development of a thin "digital mover F503iHYPER" equipped with an execution environment of i-mode mobile phone application (i-appli) written inJavaTMlanguage and will start delivering it to the NTT Docomo Group . 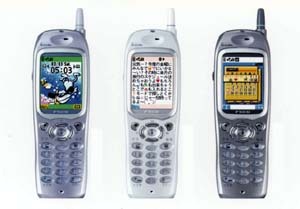 This product will be released from NTT DoCoMo from January 26, 2001. In addition, at the same time as the launch of this product, at the same time as our "@ F Keitai Cheering Team" which is one of the official NTT Docomo i-mode website, special i-appli content centering on games developed for this product Free of charge. You can download various i-appli that will be offered at the i-mode site and operate games and simple spreadsheet etc. Also, i-mode can be fully utilized with large capacity of maximum 50 items of i-appli save number, maximum of screen memo 100, maximum of 30 download songs of ring tone melody, and 6 pre-installed software is available. In addition, you can activate one (1 case) of your favorite i-appli with "my application key" installed on the back of the main unit. By developing a dedicated i-appli, it is possible to operate simple business processing on mobile phones.Furthermore, by building an application on the server side and linking it with the i-appli on the mobile phone side, it is possible to realize a more advanced mobile solution. In addition,it is possible to construct a system that extracts only the necessary information usingthe agent function(* 1),and byinstalling theSSL(* 2)function, the security of shopping and banking on i-mode is improved It is. It is equipped with a large screen color LCD of about 2 inches, and e-mail is easy to read with 10 characters 10 lines display.Moreover, because it adopts reflective display, it became bright even outdoors. In addition to the beautiful ring tone melody and the real sound effect with FM tone generator 16 chords 128 tone, as well as the ADPCM(* 3)vocalization function, it is possible to receive incoming calls and e-mails by human voice, You can notify. Since the multi cursor keys adopted in the current model are separated into four and separated, if you use the cursor keys in games etc., you can also operate easily with both hands. Moreover, by adopting the following function, excellent operability is realized. Two-touch site that you can access to your favorite site with two touch. A mail key that activates the mail reception screen and mail creation screen with one touch. Image mail that automatically displays that site if the received mail contains a URL. E-mail multicast transmission capable of sending the same content mail to a maximum of 5 people. A continuous sentence conversion function that collectively converts multiple clauses of up to 20 characters. Incoming flash that "my application key" flashes when receiving a call. * The color handled may vary depending on the area. NTT Docomo i-mode Official Site "@ F Keitai Cheering Team" will provide i-appli dedicated to "Digital Movers F503iHYPER" in order to make full use of i-appli to users of "Digital Movers F503iHYPER". (1) 100(* 4)title mini game softwarecan be downloadedfree of charge(* 5). (2) We will provide a network game "Planet W" (provisional name) that will be a resident of a fictitious planet and play against the other players on the network at no charge(* 5)from spring 2001. (3) As a convenient i-appli in everyday life, we offer "color memo", "screen calculator", "leave it to secretary" etc. free of charge(* 5). "Moova / mova", "i-mode" is a registered trademark of NTT DoCoMo, Inc.
"I Melody", "i Animation", "i Navi Link", "i Application" "i α ppli", are trademarks of NTT DoCoMo, Inc.
All trademarks related to Java and Java are trademarks or registered trademarks of Sun Microsysytems, Inc. in the United States and other countries. Other company names and product names mentioned are trademarks or registered trademarks of each company.